We're starting out the week with a very sweet giveaway because I think Monday's deserve all the help they can get. Earrings Nation is a independent jewelry shop with a large selection of pretty feminine baubles. 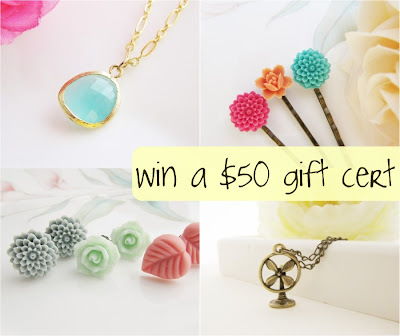 Earrings Nation is offering one D&OC reader a $50 gift certificate for anything in the shop! This means you can get a few items of your choice including my favorite piece + hairpins or earrings or maybe a ring? Entering is easy and it's open to all readers. Winner will be randomly chosen next Monday Nov. 1st. 1. Visit Earrings Nation and leave a comment telling me what you like. This one's mandatory! 2. If you're a reader of D&OC, you get a second entry for being fantastic. Just tell me how you subscribe (i.e. the feed, Google Friend Connect, etc). Make sure to leave a separate comment. 3. Share this giveaway via your own blog, Facebook, or Twitter and leave a separate comment letting me know. Thanks so much for you participation and good luck! update- the winner is #18, Lauren! I love the pop of the green against the black. I am a follower/ reader of this blog through GFC. Thanks for the giveaway! Gorgeous stuff...I'm going to have to wishlist it! I really adore the Madelyn necklace! I am a follower through blogger, I think that is google? I really like the Whimsical Owl - Antique bronze Big Owl charm with Swarovski Pearls Long Necklace. I would get the tree of life necklace and the Simple Attraction necklace. These would make great gifts too. I'm a follower (google reader). I keep D&OC on my igoogle home page and check in every day to get my fix. The "earring nation" question: Every piece appeals to different parts of me from different lives I've led. Or maybe they're all equally awesome! Either way, I'll have a hard time choosing but feel up to the challenge. I love all of the cobachan earrings. So cute! Oh, I'm a follower on google. I adore you and your sweet blog. I'm a sucker for pendants, so I'd have to go with the bird perched on a branch locket or the tree of life necklace. Gorgeous! The Sky Blue Chysanthumum Ring is my favortie! Oooohhh I hope I win because I'm so broke but I'd love it! I also follow you using friend connect! The list of things I like is a long one, here. In particular: the leaf and feather bronze tone necklaces, the orchid earrings (even though I can't wear them), the light pink rose cabochon necklace, the three lucky circles silver necklace, and any of the rings and hairpins. I think I'm done, here. Thanks! In addition to other items, I adore the My Sweet Little Birdie necklace. I also subscribe to D&OC via Google Reader. I love the little birdie necklace-or the mr owl necklace-or anything! Its all so cute and fun. And I'm a reader, of course! I think the "Golden leaves - Antique bronze leaf charms and Swarovski pearls Earrings" are just lovely. Could be dressed up or down. Posting this giveaway to my blog right now! I am in love with the Whimsical Tree necklace (http://www.etsy.com/listing/57494413/whimsical-tree-matt-gold-plated-tree) But everything is so so so pretty! i like this ring . i just subscribed through the rss feed with google reader . As in much of life, picking favorites is hard for me. I think it might be the Lost Boat necklace with the spy glass. But I also really like the rough cut glass everything. Oh yes and I follow via Blogger! I love the "Sweet Simple - Gold plated twisted connector Charms and Glass tear drops Earrings." I'm also a fan of "Silver Leaf." I'm a regular reader of D&OC -- I subscribe via my Google Reader. I love the Mr. Owl necklace. I love the whimsical owl necklace, it's my favorite!! I follow D&OC through Google Reader! I love the Simply me - white gold plated lotus leaf charm earrings. Beautiful! What do I like? I mean, what DON'T I like?! My favorite items are anything to do with birds, trees, and flowers... is that narrow enough? I especially like the Tree of Life necklace. Might be my fave. I subscribe through my Google Reader newsfeed! Love it! I love the orange lover hair pins. They'd be so much fun to have...I might just have to go get them now. I'm a follower...through google friend connect. The Hoja - Simple gold plated leaf charms Earrings are my favorite item! i like the flower lucite earrings! adorable! and i did a jewelry post today, so i can link this in there somewhere! Love this shop! I would go a little crazy with all the aqua blue ... I love the bright blue rose earrings and the coral/tangerine/blue colorful flower earring trio. Also love the silver orchid necklace and earrings and silver the tree of life necklace and a million other things! long time follower on google friend connect. xo. tweeted (and linked it to you)! I have a phobia of real life birds but not the beautiful Bird Perch on a Branch! Thanks for the giveaway!I love the unicorn and flower necklace. I may have to get it even if I don't win, you tricksters you! Love your blog too. I just love this sweet necklace! ..and I'm a follower too! I LOVE the owl necklace! Her whole shop is so cute! Gosh, so many wonderful things. I just can't stop at one accessory. These are some of my favorites: Love Messenger, The Lost Boat, My little Squirrel, Sweet Mobile and Little Birdie in the Cage! Love the "simple word called LOVE" and the Two of Us necklaces! I loooooove the poppies necklace (cause they're my fave!) and the orchid earrings both so much! What a cute store, seriously. Oh what a lovely shop! The whimsical owl necklace is adorable! What a great giveaway - thanks so much for having it! I couldn't pick just one favorite, so I'm cheating and have two. One is the Mia earrings (http://www.etsy.com/listing/39116916/mia-shining-silver-plated-ear-studs-with) and the other is the O-Shaped Posts (http://www.etsy.com/listing/51547398/oooooo-matte-silver-finish-o-shape-ear). I'm a faithful Blogger follower. I love love love the lockets! Love the pearls on silver posts !! That piece is gorgeous beyond words! I love the Coral Red Sakura Flower Cabochon and Madeira Topaz Vintage Glass Stone Necklace. I'm loving the sweet simple - Sea foam glass with matte white gold trimmed locket necklace!!! there is SO MUCH that i like! but i think if i won, i would buy the "owls on love tree" necklace because it somehow combines all my favorite things : owls, trees, & whimsical romance! Am a regular follower (first time poster today, though!) via Google Reader. ...and I've posted the giveaway on Facebook! I love everything, but I've especially got my eye on the Colorful Flower cabochon Ear posts Trio Set. so pretty. also, I subscribe on my google reader! It's so hard to choose a favorite, but I think I'd have to say the Fuschia Rose Cabochon. I read via my google reader. Love reading your posts. You find such beautiful items. And okay I'll twitter this and leave a separate comment. My separate entry for the tweet. I mentioned you. OKAY. that's enough from me. I just love the Orchid Trio Dangle earrings, the Beautiful Peacock earrings, and I just can't decide which owl necklace I like the most! I subscribed using Google Reader as my rss follower/thing/whatever you call it. I love the Silver leaf - White gold plated detail leaf charm Earrings! There's so much detail in them. I love the Coral Red Sakura Flower Cabochon and Madeira Topaz Vintage Glass Stone Necklace, very pretty! i have always loved earrings nation's cabochon earrings. and have always wanted one! and i sent out a tweet too! My favorites would be the "Three little owls in a tree" because it reminds me of my two little daughters and myself and how we are always together, and the "Orchid trio dangle earrings" because it reminds me of home, where orchids grow wild. I grew up in Malaysia, a neighbor of Singapore, where this wonderful jewelry designer/maker resides. I subscribe to your feed -- Yaay! I love Down and Out Chic for so many reasons! Ohhhh Muhhh Gaawd! Such lovely trinkets!... I'd have to fight between the 'Two of Us' locket, the 'Turquoise Pom Pom earrings' or the 'Turquoise Rose flower ring'. Ps: I follow through Google Connect. I subscribe through Google/Feedly reader. I LOVE my feedly. It's all levels of pretty. My favourite items from Earrings Nation are "Romantic Pink Petite Rose Flower Cabochon Victorian Style Ring" & "Tweety Bird - Antique bronze bird charm Necklace". I follow D&OC via Google Friend Connect. Thank you! LOVE the mint green cabochon earrings! but it was so hard to choose! I love the forest green color! I am also a follower via google reader. Thanks for doing this giveaway! I love the feather pendant, but I also live all of the owl pieces! So cute! Thanks for the giveaway! I love the Simply Oriental earrings! I follow you via an RSS feed and GFC! I subscribed with My Yahoo! I like it all but I really like the Elegance necklace. I love the seafoam glass necklace you also show in your photo! the love birds are my fave...i could find a gazillion places to wear those them out to! Wow! Great stuff. I'd pick the golden leaf w/orange jade necklace, simple bubbles earrings, golden rosey earrings ... maybe more! Thanks for having such a great blog with such awesome links and ways to decorate!! Love so many items on Earrings Nation, one of my favourites is Listing # 51460051 the together forever bird necklace. Beautiful! The gold plated Hoja earrings and the tangerine flower earrings! Je veux!